Writing this new, randomly-posted blog instead of my daily Tour of America blog has caused several curious dilemmas for me. One, for example, is that when I don’t write every day, a week later I often can’t remember what I did. With the old blog, I could just look it up, but now days disappear from time to time. I seem to have a choice: write daily or accept that some days will blur into the past. Another dilemma is that photos are piling up on my computer. Taken with intent, but unused, some of them deserve a better fate than to sit on a hard drive awaiting the rare possibility that I might need them for an article in the future. To resolve this, I have decided that every few weeks or months, I’ll pull out a few of my favorite images and run them all together as “Random photos.” Not only will I be able to share a few possibly interesting images, but I can document a few small events that otherwise might not have made the record. Here’s the first installment. (All photos are by me unless otherwise noted.) 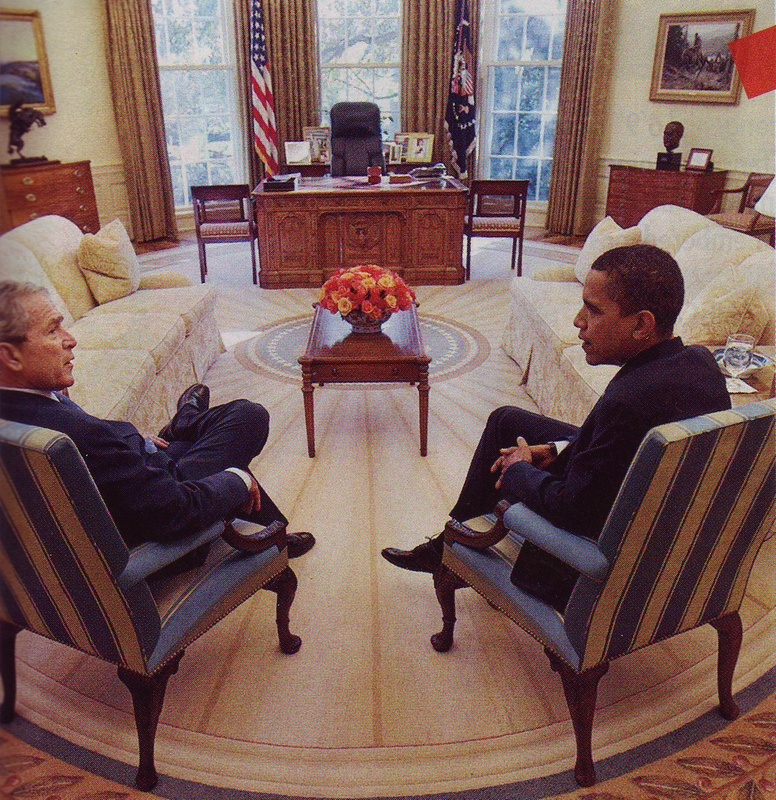 Click any photo to enlarge it. I was at March Field with Terry and Marie last month, touring the aviation museum, when this large jet began practicing touch-and-go landings. At some points the jet was close enough that with a 200mm lens it felt like I could reach out and touch it. I haven’t bothered to research the model of the aircraft; perhaps a reader will identify it for us. We don’t have a cat, but this one has been showing up in the backyard occasionally. That’s a neat trick considering our backyard is entirely surrounded by 5-7 foot walls. 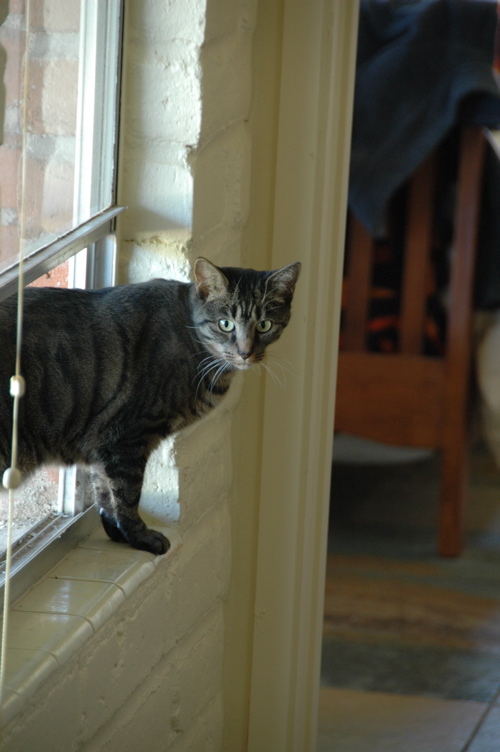 Eleanor, being a major softie for cats (but allergic to them), left the window open with the hope that the critter would visit. The cat thought she was being clever, but I caught her in the act. Once she saw my camera, she ran like a Hollywood starlet spotted in Wal-Mart. The blue-and-cream “Beach Club” fabric that came with our Airstream turned out to be wholly impractical. Not only did it immediately start to darken with dirt, but it seemed that there was no stain which could be cleaned off it. After three years of spaghetti sauce, kid feet, and several unsuccessful attempts to wash it, we finally gave up and asked our friend Greg to make covers for us from a more kid-proof fabric. The result is the brown Southwestern themed cushions you see in the photo. By the way, Greg says if anyone comes to Tucson to visit us and stays for at least a few days, he’d be willing to make a set for them while they wait. We’re probably going to ask him to recover the rest of the dinette as well. Since I’m usually behind the camera, this is a rare photo. You can see how I dressed up and got my hair coiffed for Thanksgiving. 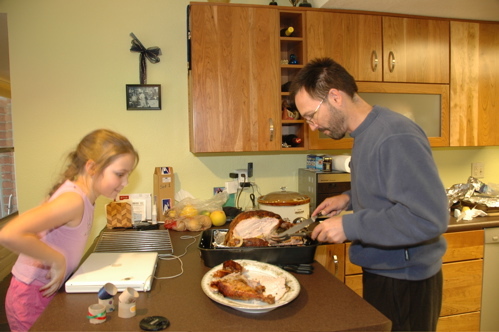 Emma is peering over anxiously to make sure I cut plenty of dark meat for her. Later, when she’s a teenager and utterly rejecting us for our meat-eating barbarism, this photo will be useful blackmail material. On the wall between us is a black-and-white photo of Eleanor’s grandfather, Martin Manzonetta, during his reign as Head Chef at Boston’s famous Locke-Ober restaurant. 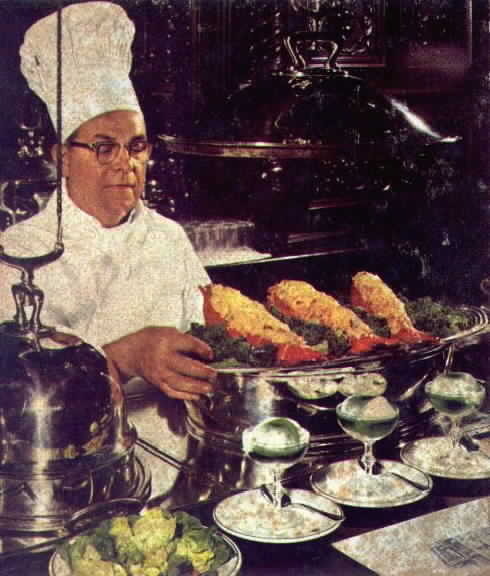 You can see him at right in a scanned image from a magazine article, showing his famous dish Lobster Savannah (still served at the Locke-Ober today). Tucson is not a place known for thunderstorms in November, but we had a few beauties around Thanksgiving, and one of them resulted in a spectacular rainbow just to the north of our house. Emma spotted it and I got a few great shots. 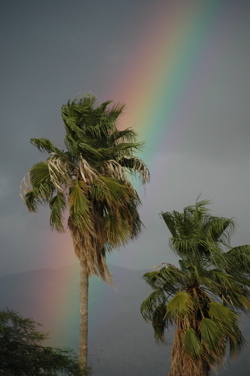 In Hawaii, a rainbow over a palm tree is a common sight, but here in Tucson it’s more like getting snow at Christmastime. To my mind, it’s better than snow at Christmastime. A palm tree swaying in a gentle warm breeze is exactly the symbol I want to remember this Thanksgiving. How much should the recovering cost?? 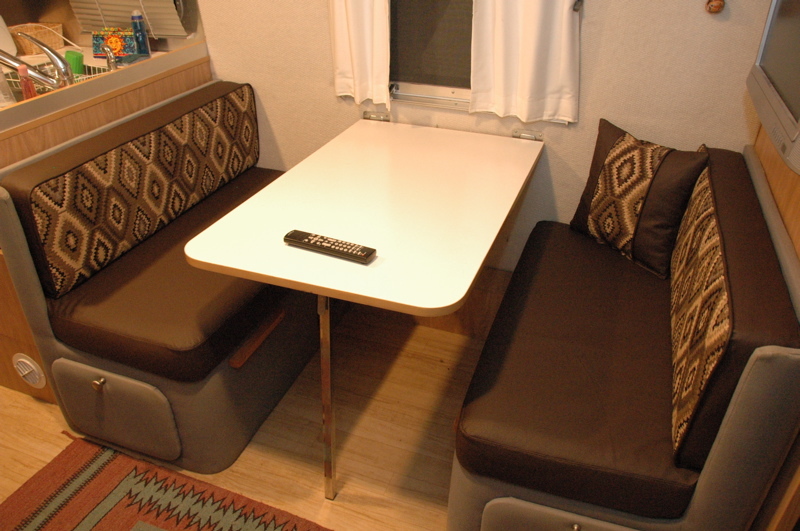 I would like to have some work done for my trailer, but I would like to have a ballpark figure. Upholstery work is expensive. I couldn’t say what you should expect because I’m not the guy doing the work, and it varies a lot from project to project (based on fabric choice, foam, number of cushions, etc). But certainly even small jobs run hundreds of dollars, and a whole trailer can easily exceed $1k. The Air Force jet is a Lockheed C-5 Galaxy, version B or later. It may still be the largest “Free World” aircraft. The C-5A was first flown in 1968. It has a 222 foot wingspan. Very impressive photo of a very impressive plane. I think the plane is actually a C-17A. This is what I found when I searched the tail number..
At the end of June, someone else got a photo of it at Ramstein, Germany. That may be a C-17. I have flown in a C-5 and it is far more massive (double decked). The passenger compartment of the C-5 located at the base of the tail which looks like a hump from the outside. 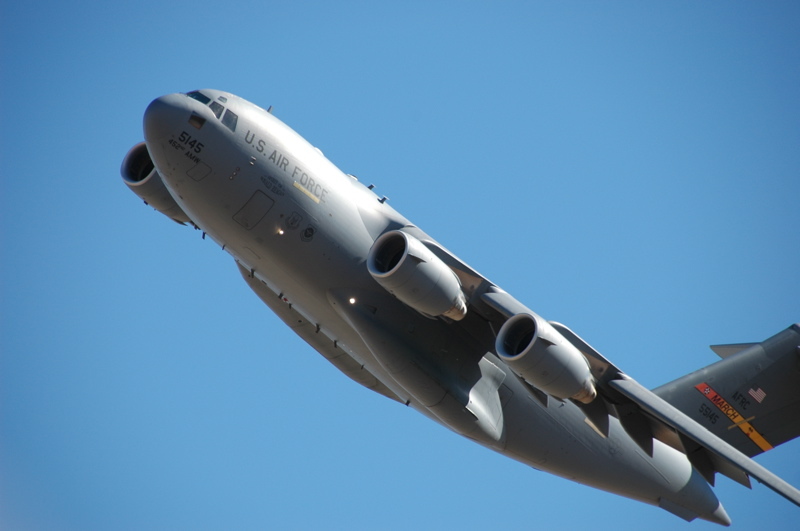 The aircraft is a C-17 GLOBEMASTER III, which is made by McDonnell Douglas (Now Boeing). We have C-5s based here in Memphis which are much longer. Sometimes a C-17 will land here which is shorter and has bent wings (winglets)and looks kind of squatty. I work on MD-11, MD-10, and DC-10s and the C-17 nose looks just like a Douglas A/C. Notice the modern updated engines in the photo. Great Photo Rich. All of you are correct, it is a C-17, no doubt about it. My book on military aircraft is really dated. The C-17 wasn’t even flying when it was printed. I should have googled instead! Still, a great photo of another great aircraft, only a 169.8′ wingspan though. Just a little plane.